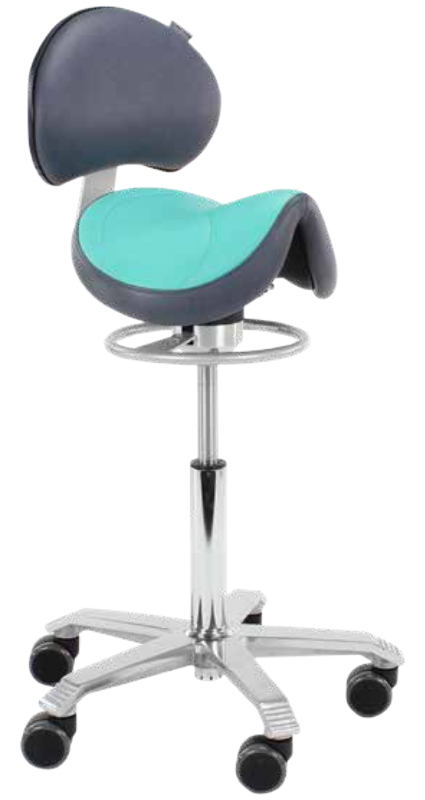 The Balance mechanism is located directly below the seat, enabling the seat to move and shift with any body movement. 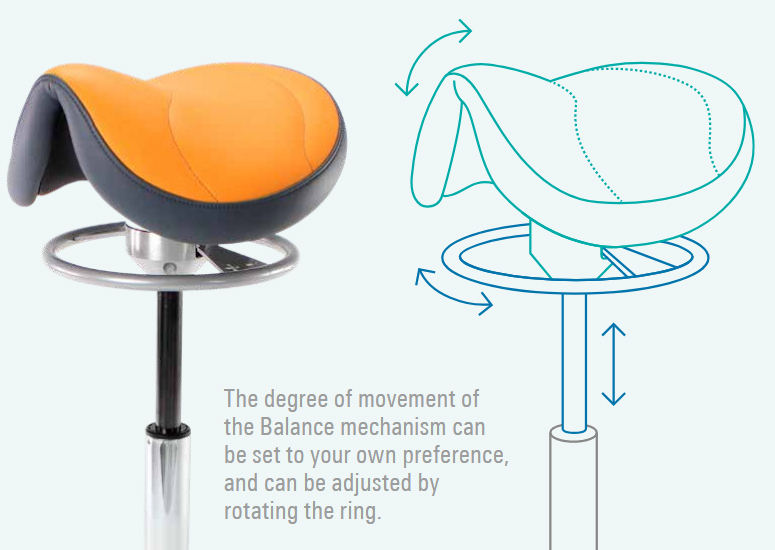 In order to accommodate the diverse requirements of users the degree of resistance on the movement is easily adjusted with a few turns of the ring located just below the seat. This ring also doubles as a height adjustment release meaning that there is no need to reach and find a lever in only one location when height adjustment is required, as the ring is accessible at any position. The broad saddle of the Jumper Balance is suited to those of larger build or wide hips. Those with smaller build may be interested in the Amazone Balance. The pommel has a noticeable rise which some users might find uncomfortable. The posture created by the Jumper Balance means that most users will find roughly half of their weight supported by the chair with the balance shared between the feet. The Lumbar Support is adjustable in depth and follows the movement of the saddle, providing support at all times and positions. 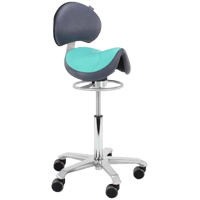 Currently the Jumper Balance with Lumbar Support is available with premium 2-tone Teal/Anthracite Stamskin® artificial leather for extreme durability and comfort. Core Strengthening - The movement created by the BALANCE Mechanism strengthens the core muscles as they respond to compensate for every movement of the body as the user leans and shifts. This movement also ensures that the muscles are in constant action as they work to ensure that the user remains completely stable on the Balance seat. This movement can also be employed to a greater extent to consciously exercise the core by having the user train themselves to actively shift and counterbalance throughout the course of the day. The level of resistance to movement can be adjusted to personally preferred levels. Freedom of Movement - Saddle Seats such as the Jumper Balance encourage the entire upper body to move more freely than a traditional chair. In the absence of side or back constraints users are able to freely lean, stretch, and arch as they wish. This freedom translates into improved back mobility as it remains in constant flex. The upward stance of this style of seat also increases alertness as the entire body becomes involved in the sitting experience. Correct Spinal Alignment (Improved Posture) - Score Saddle Seats are designed to restore the correct alignment of the spine. This is accomplished when the pelvis is tipped forward due to the 45° downward angle of the thighs. The forward tilt of the pelvis restores the natural "S-Curve" of the spine, positioning it where it can best provide the support necessary for the torso, neck and head. Traditional chair seats actually force the lumbar portion of the spine outward (creating a "C-Curve"), exerting unnatural and unsupported stress on the soft tissue muscles and ligaments of the lower back. The improved alignment of the spine which the saddle seating promotes alleviates or removes that stress, reducing fatigue by enabling those tissues to relax and rest. The "Balance" mechanism on the Jumper Balance offers a greater degree of comfort as it permits the seat to follow the body as it moves. Reduced "Overreach" - A complaint commonly associated with traditional seating is that it is difficult to reach items positioned to the sides or front. Doing so requires a significant rotation forward or outward from the shoulder, often combined with a forward bend from the waist. This can be a cause for concern for two reasons. First, the extreme reaching of the arms and the high degree of rotation necessary to accomplish this can lead to the development of shoulder-related issues. Usually this is addressed by trying to adapt the work area to the user by bringing frequently used items and equipment closer. However, there is always a limitation to dimensions of the comfort zone so this is usually only partially effective as a solution. The second area of concern related to the overreach is that when items are out of reach users will attempt to extend the limited range of their arms by "bending" or "stretching" forward from the waist. This exerts unnatural and unnecessary stress on the lower back, increasing the potential for development of lower back pain. A Jumper Balance seat addresses both of these concerns by providing a significantly increased reaching zone. The forward tilt of the pelvis immediately provides several inches of additional forward reach that cannot be available when seated in a traditional chair as the upper body is brought into closer proximity to the work space. In combination with this is the fact that a saddle seat position permits the entire torso to accomplish the reach, rather than relying on a single joint such as the shoulder. By spreading the reaching movement throughout the upper body not only are users able to reduce the angle of the shoulder rotation but also the potential for stress on the lower back. The result of this is that the reach of an average user can easily and comfortably be extended 12" - 18" beyond what they could normally reach from a traditional chair. Achieve Sit/Stand Benefits WITHOUT Standing - Due to the unique posture and active seating position that the Jumper Balance offers, the user is able to realize many of the benefits attributed to an active standing posture without some of the accompanying concerns. 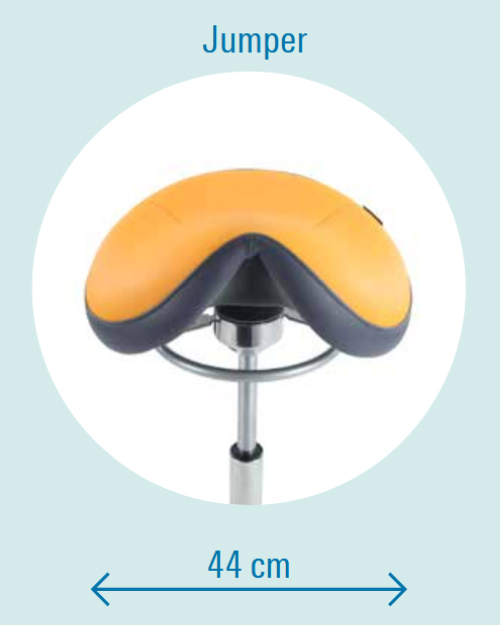 The rocking motion of the seat can improve core muscle tone, posture is improved, blood flow is increased due to the greater degree of movement offered, and improved overall abdominal activity due to the open and upright stance ensures improved bloodflow and increased metabolism. This automatically results in a greater degree of alertness and the ability to better focus on the tasks at hand. IMPORTANT NOTE - Working in a Saddle Seat will generally require some modifications to the workstation. Since it elevates the torso of the user there will be a requirement to ensure that keyboard, mouse and monitor are all able to be brought into an appropriate height position in order to maintain a neutral posture for the hands, arms, and neck. For average or shorter users this might be able to be accomplished by elevating the desk using specialized lifters such as Raise-Its which can safely raise a desk by up to 3". Standard keyboard arms and trays may also provide enough elevation or may be utilized in combination with a product like the Raise-Its. The monitor mount may have enough range to elevate the screen to the desired greater height or a few simple monitor risers in combination with its integral movement may provide the necessary elevation. For more complex scenarios such as taller users it may be necessary to provide an elevating workstation that can be raised enough to bring these devices into the correct alignment. The advantage that a Saddle Seat offers over a Sit/Stand workstation is that the user is still in a seated position and the monitor and keyboard do not need to shift throughout the day as the range of motion and viewing angles do not change. Adjustable Height Options: Three different height options are available - enabling the Jumper Balance to meet the seating heights of users ranging from 4' to 6'5" or over.